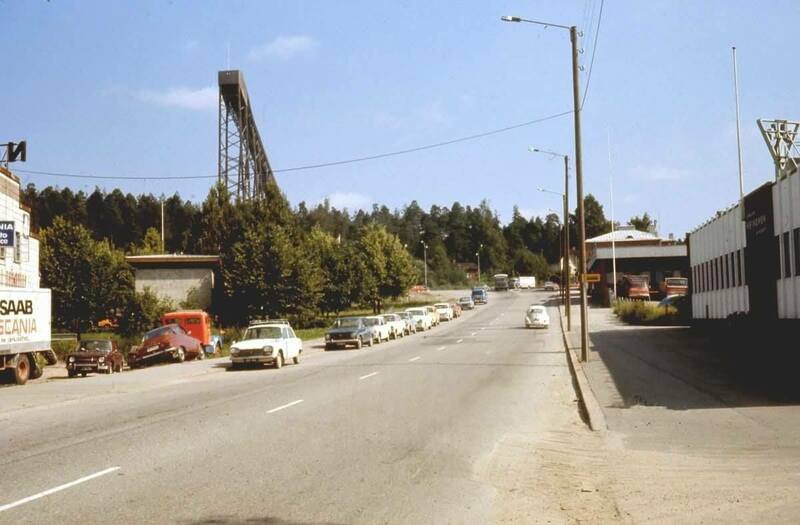 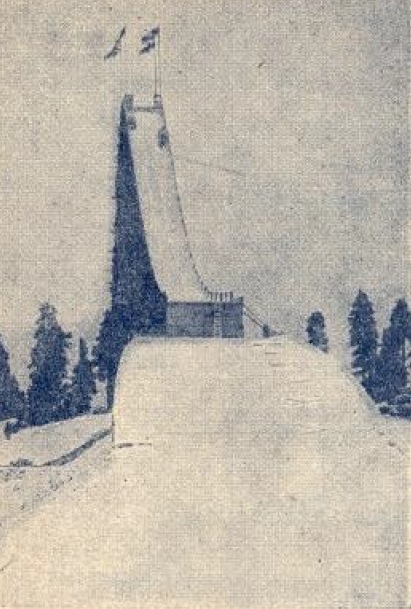 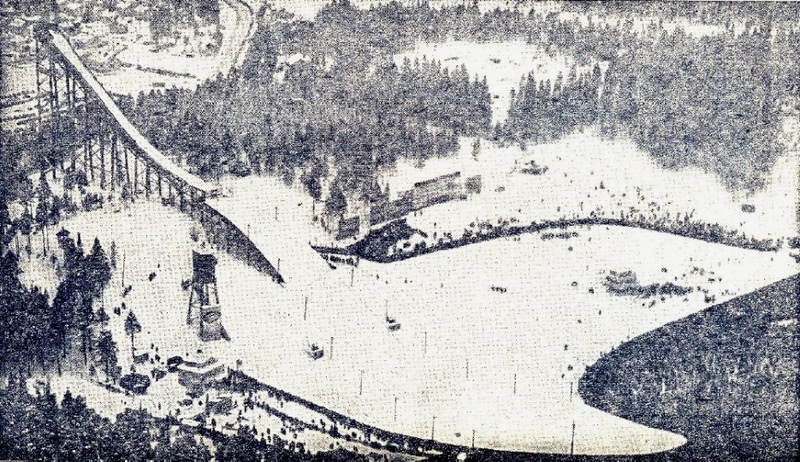 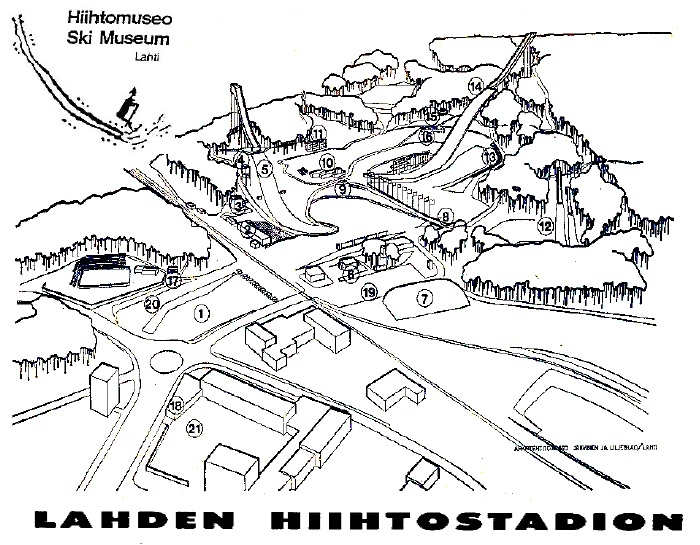 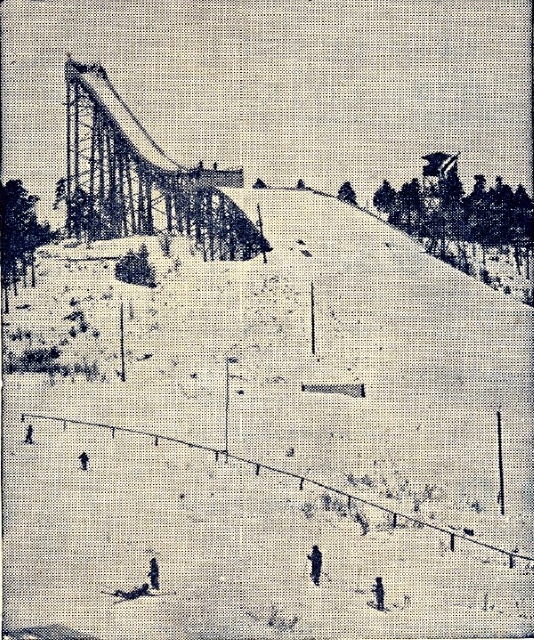 Lahden Hiihtoseura (Lahti ski club) was founded on March 4, 1922 and in fall of the same year the construction of the first ski jumping hill started at Salpausselkä area, which had been leased to the club by the town council for 50 years. 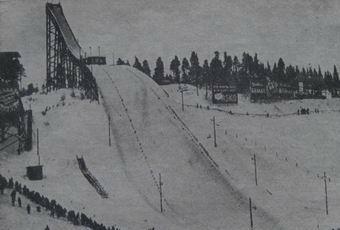 The hill was projected by Robert Persson from Norway and finished in December 1922 - the very first jump was (only) 11 meters long. 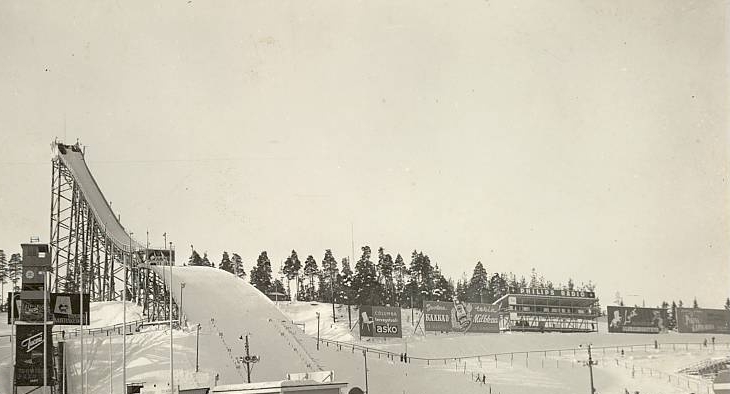 This 40-meter hill was located on the southern side of today's Salpausselkä ski stadium, opposite of the main spectator stands. 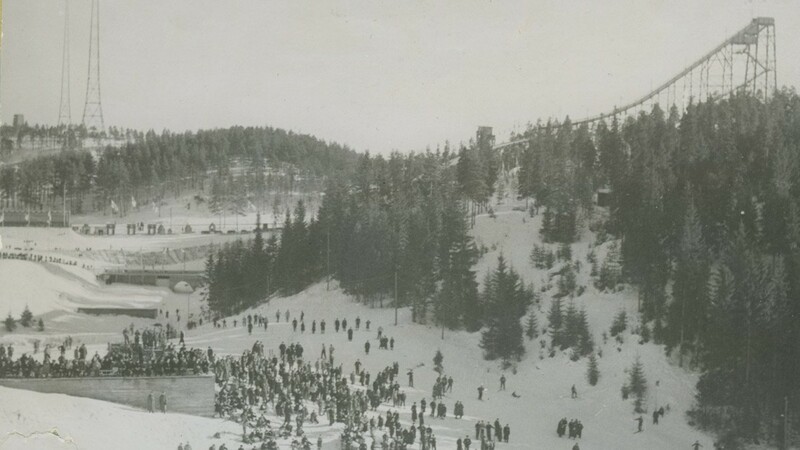 On February 3-4, 1923, the very first Lahri ski games, the "Salpausselän kisat", were oragnized - establishing one of the most traditional competitions in Nordic skiing. 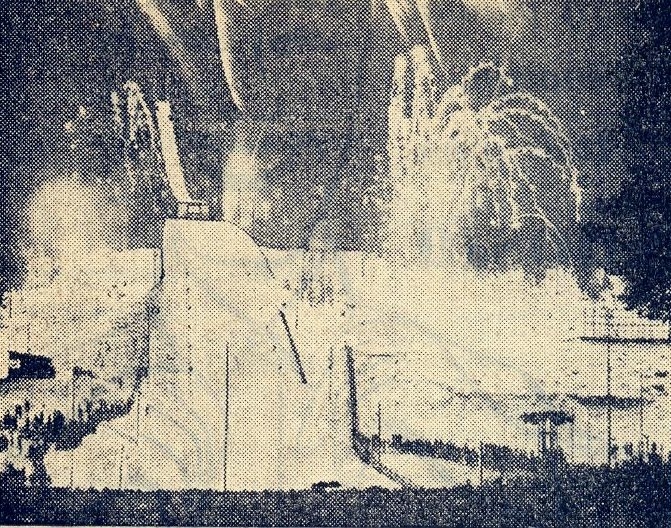 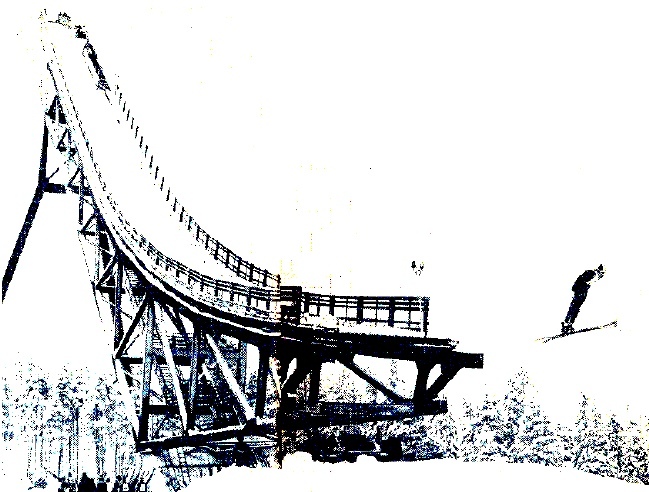 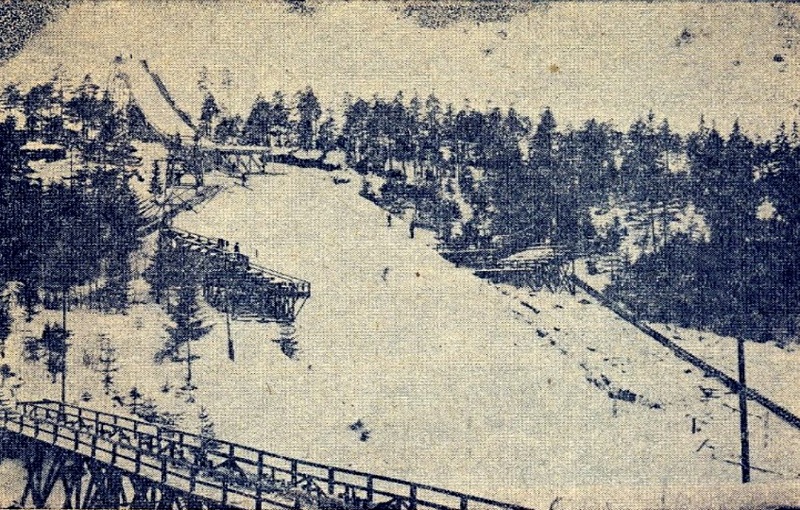 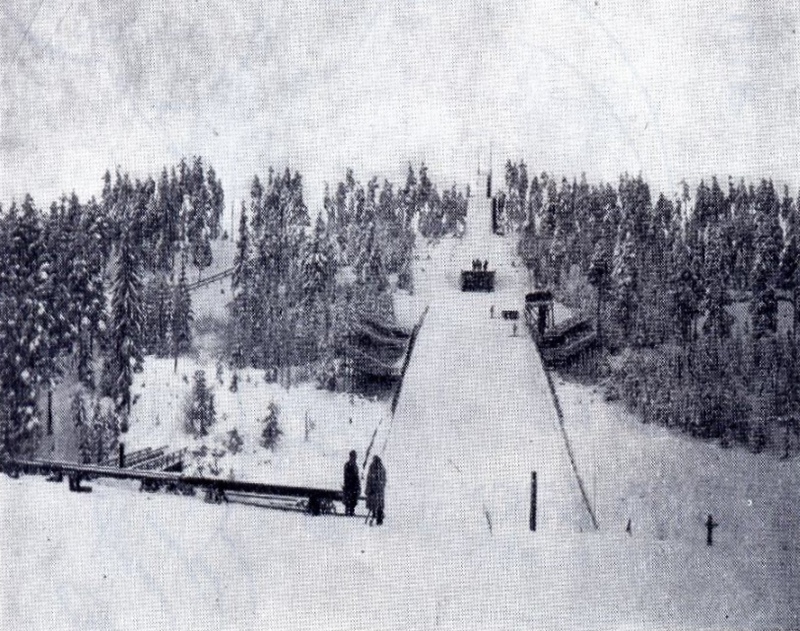 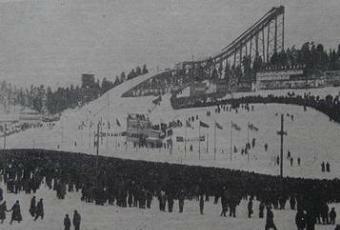 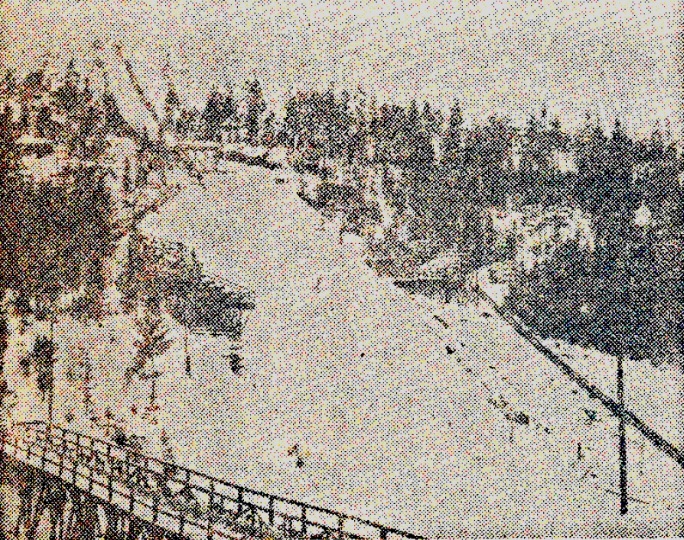 The first WSC at Lahti was held in 1926. 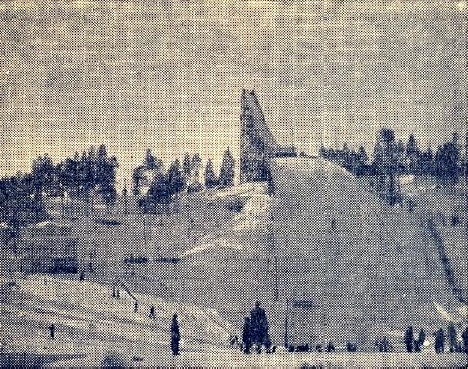 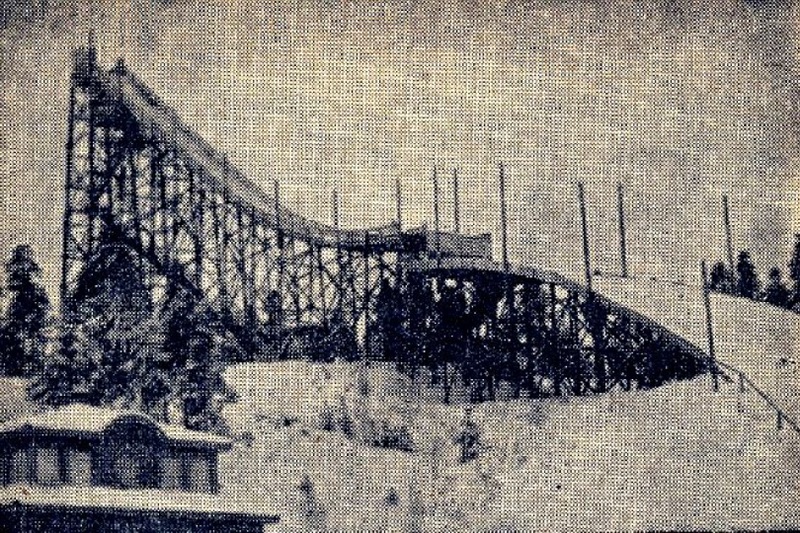 In the following years the hill had been constantly modified and was enlarged in 1932. 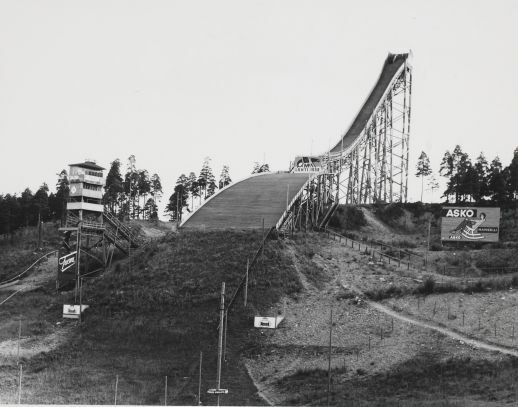 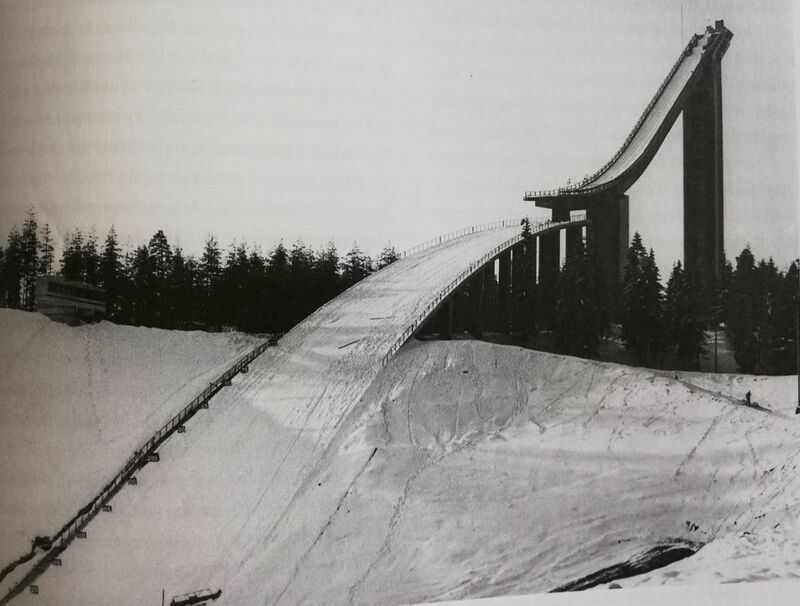 For the next World Championships in 1938 the ski jumping hill was completely rebuilt as K62.5 with a might wooden inrun structure and knoll. 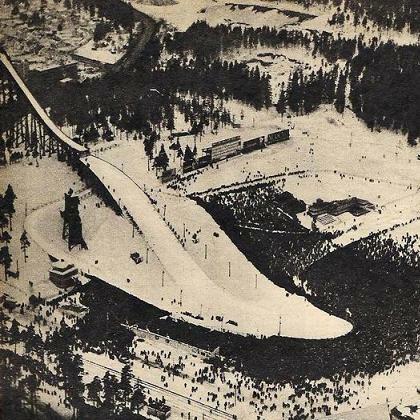 Also the ski stadium and stands were enlarged, such that ca. 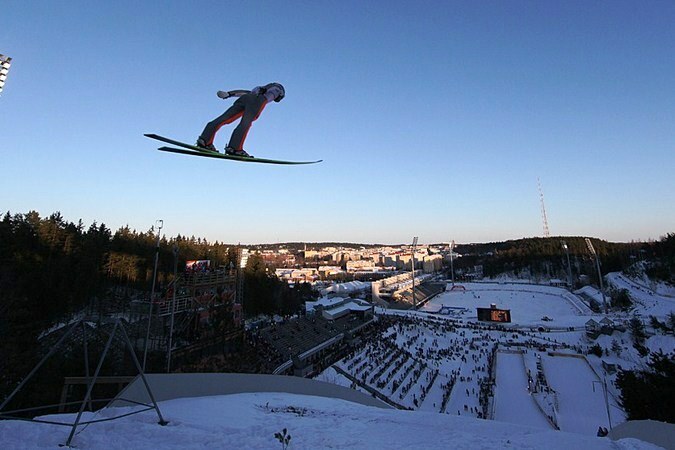 60,000 spectators could cheer for the new World Champion, Norway’s Asbjörn Ruud. 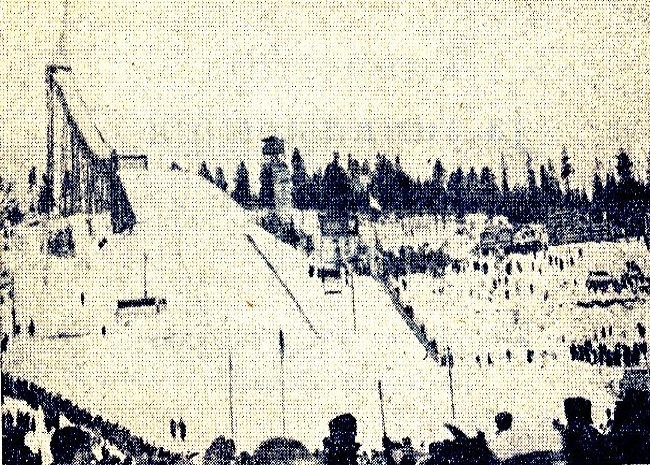 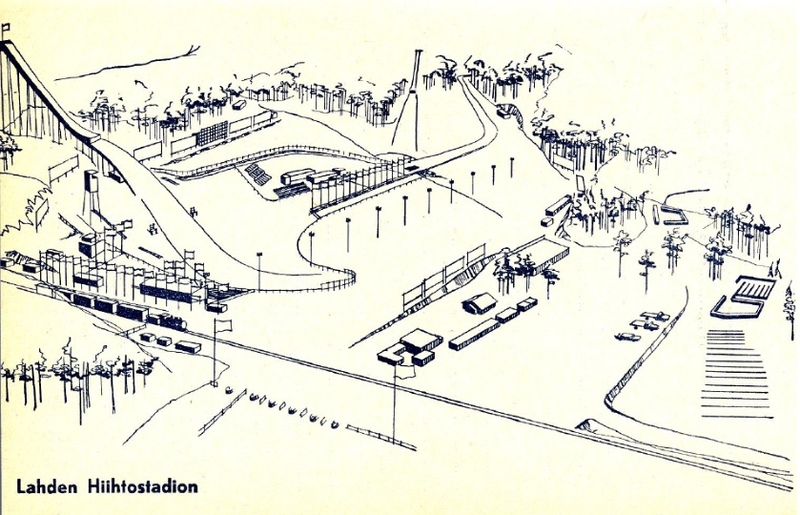 For the next WSC in 1957 the ski stadium was once again modernized, but the hill had not been enlarged. 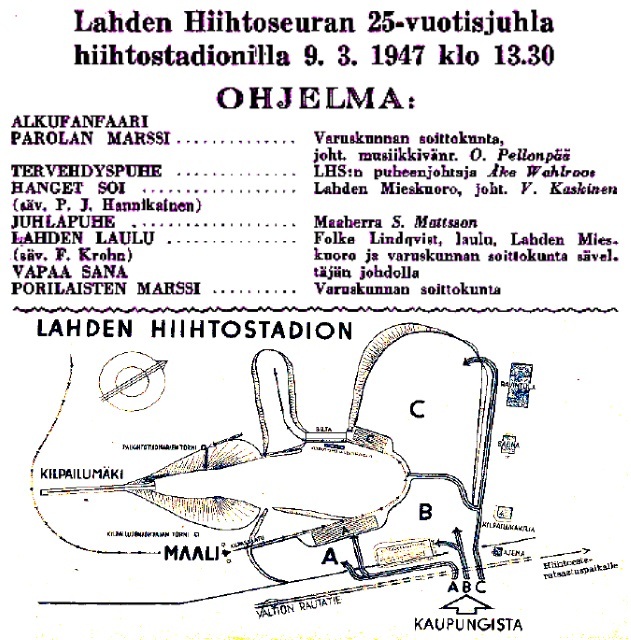 67,000 spectators were witnesses to Finland’s Juhani Kärkinen becoming new world champion. 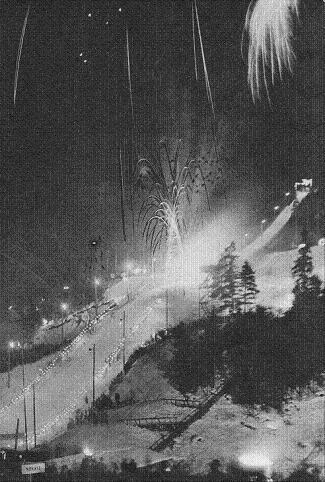 A new spectator record of 114,082 visitors was registered during Ski Games of 1964 - before that the hill had been enlarged to K74. 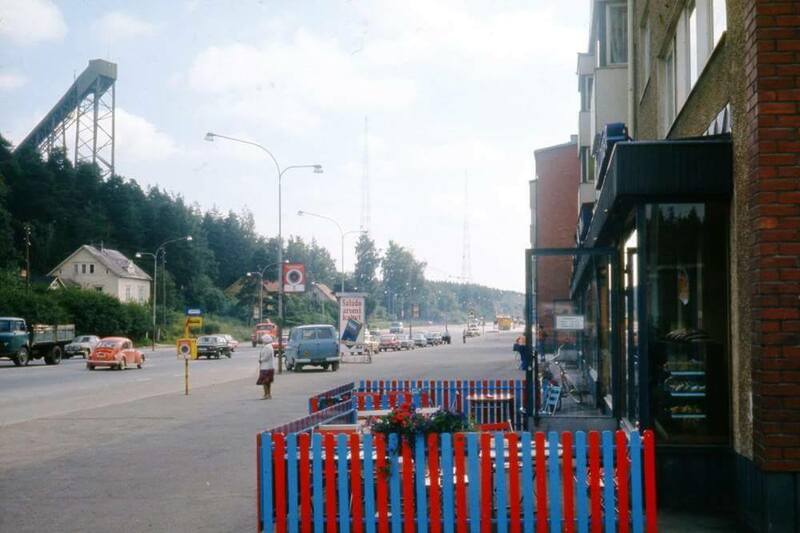 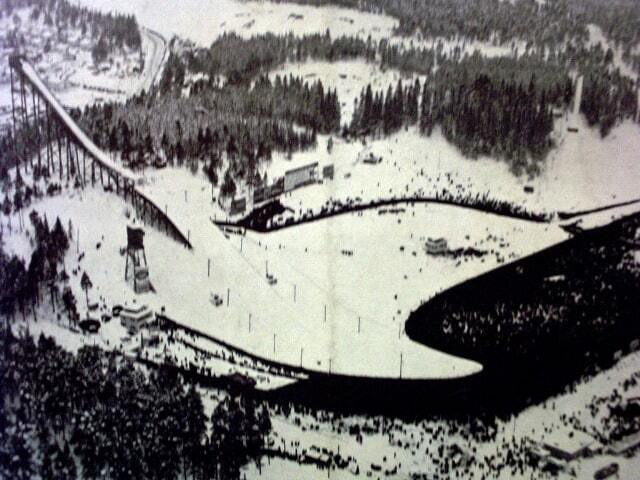 Two years later the very first team competition was held at Lahti with the GDR claiming the victory. 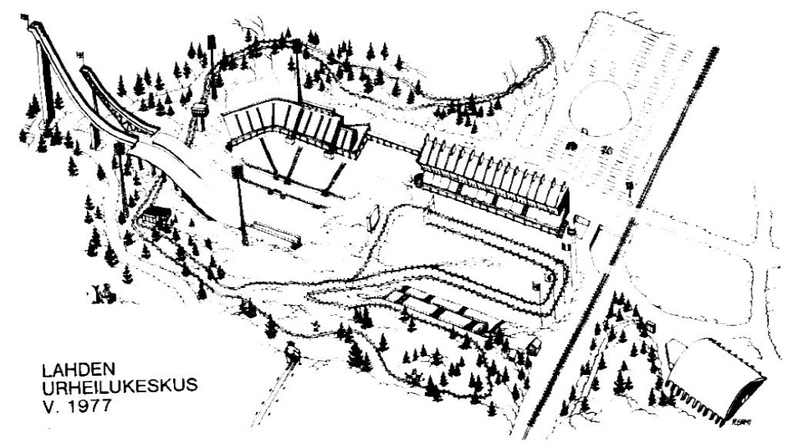 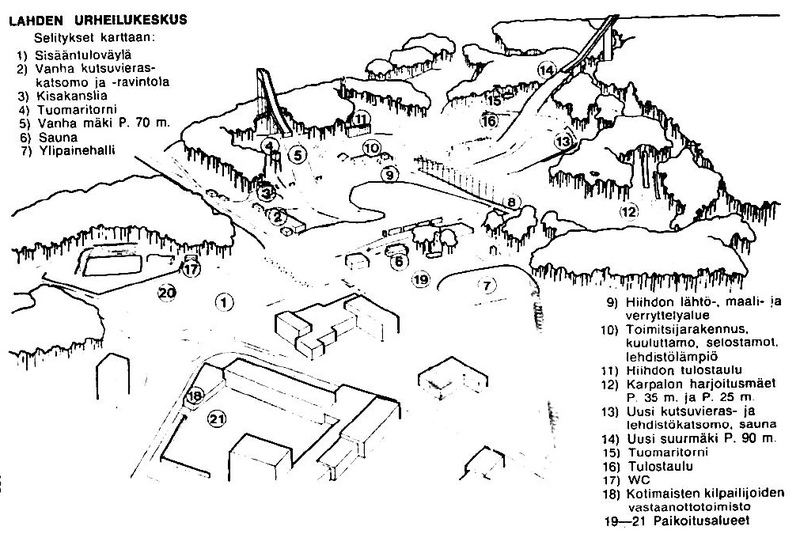 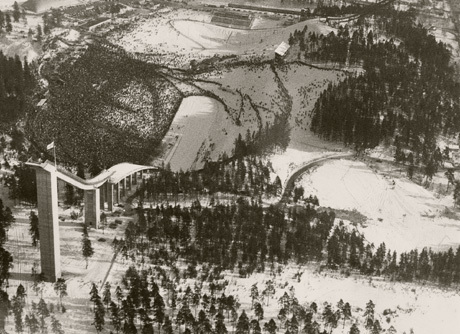 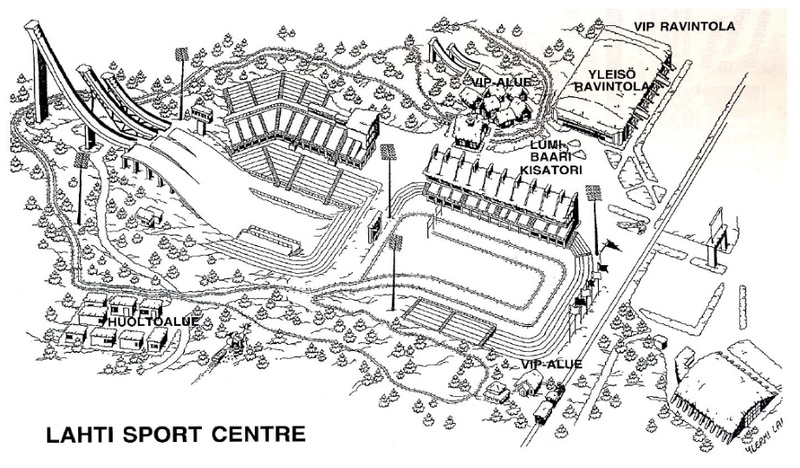 In 1970 the complete remodelling of Salpausselkä ski stadium in its current form started. 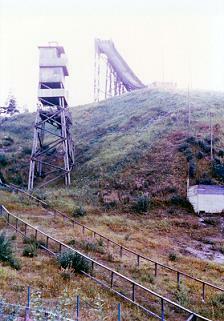 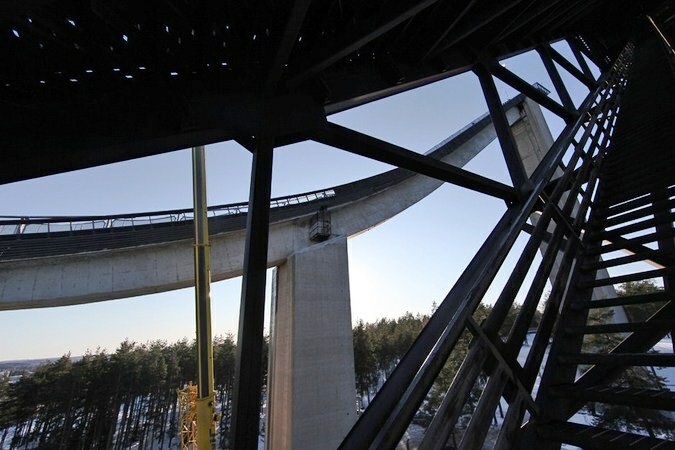 The new K113 large hill with a 55 meter high inrun tower and knoll made from reinforced concrete was completed in 1972. 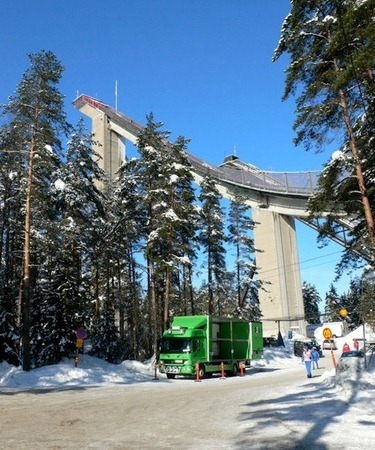 The structure designed by Sulo Järvinen, Erik Liljeblad and Pertti Piirto had won the "concrete structure of the year" award in Finland in 1971. 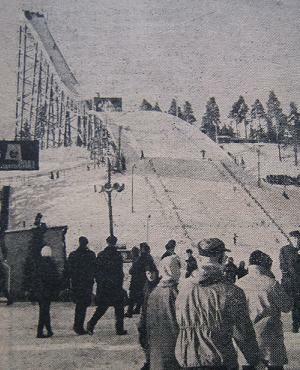 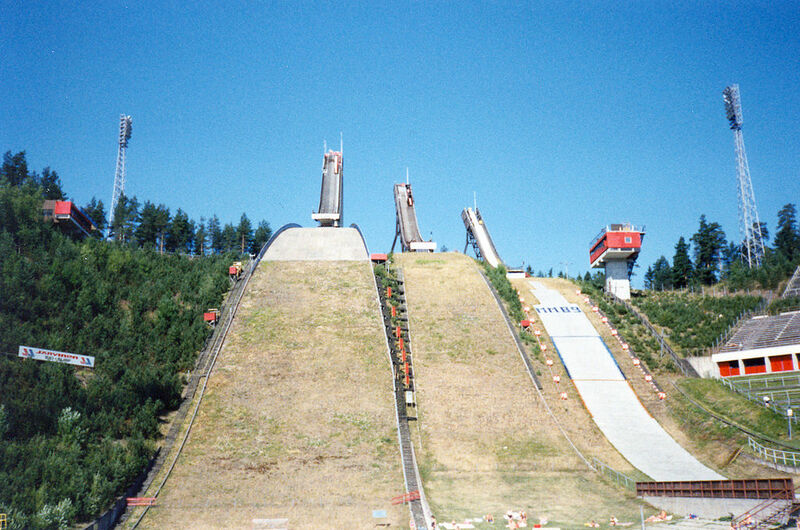 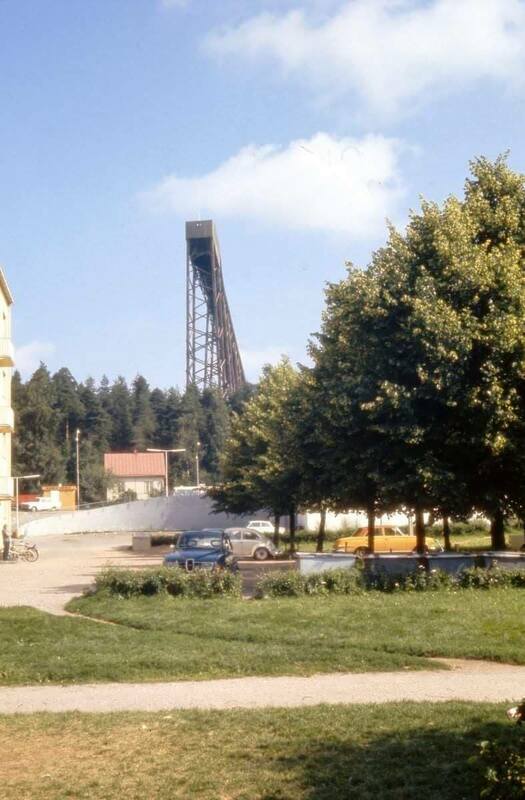 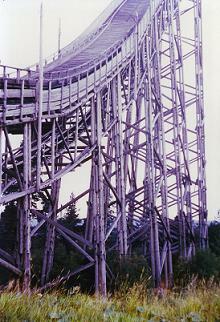 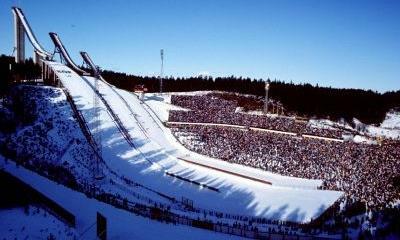 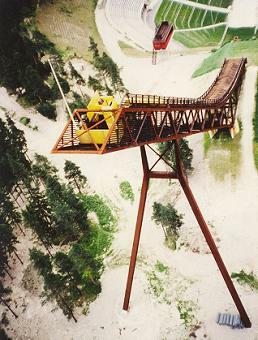 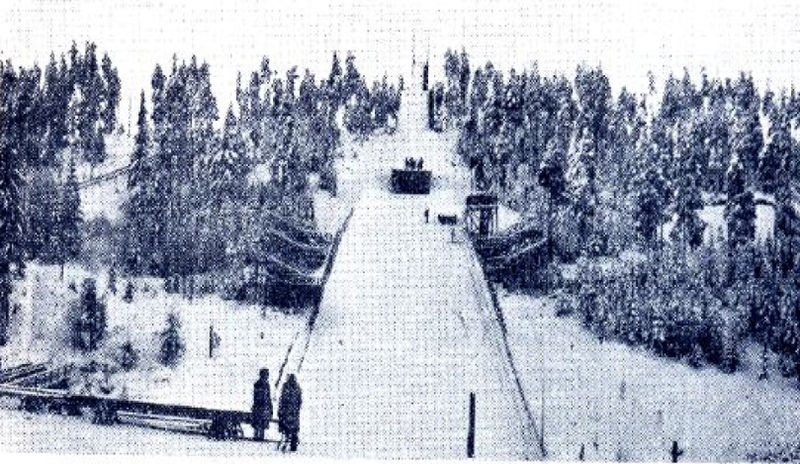 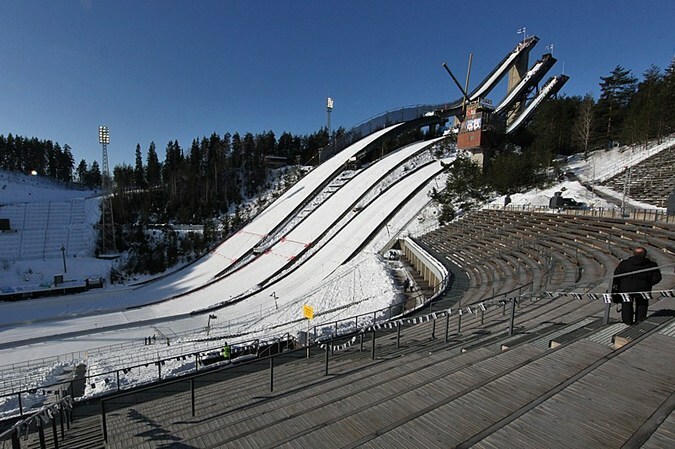 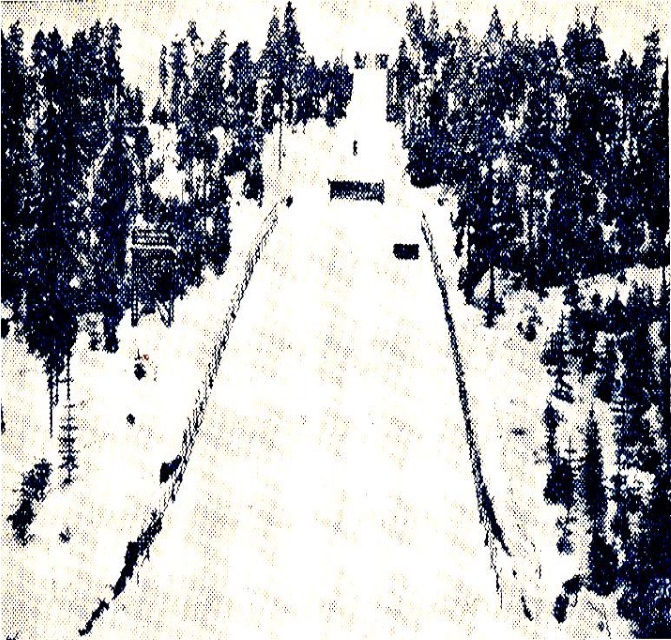 The old, wooden K74 hill was still used until 1976, when the new K88 normal hill right next to the large hill was completed, followed by the medium K64 hill in 1977. 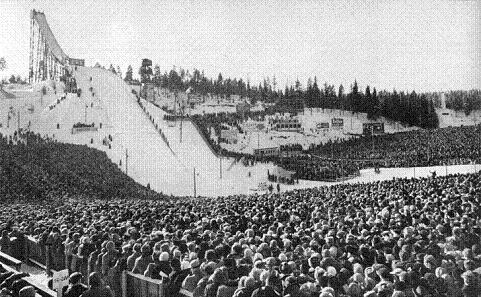 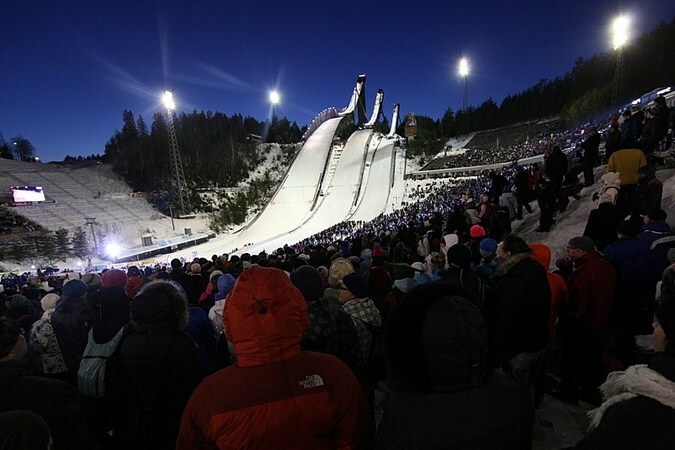 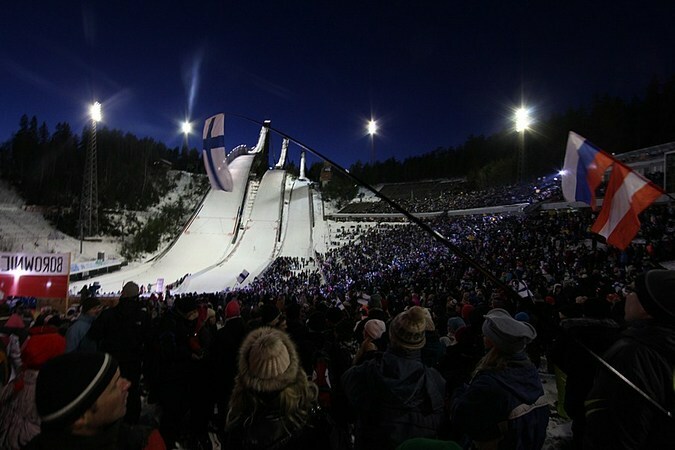 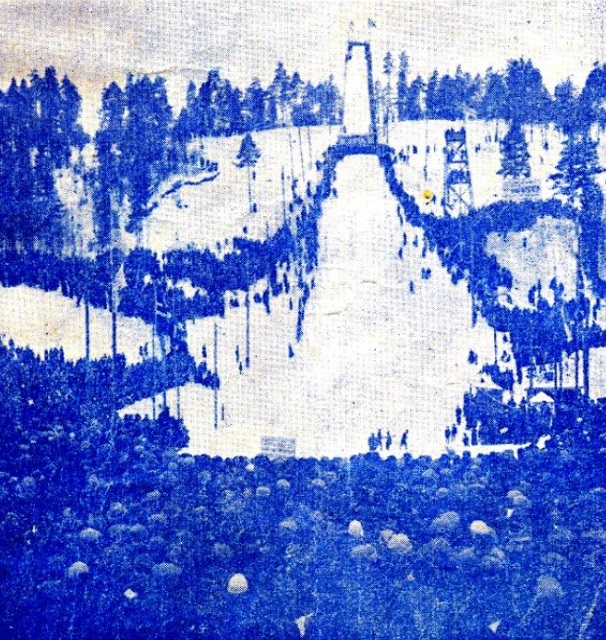 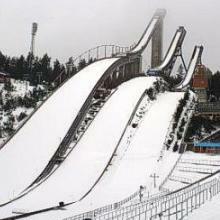 One year later Lahti was again hosting the WSC and East-German Matthias Buse won on the normal hill, while on the large hill Finland's Taipo Räisänen gained a surprise-victory. 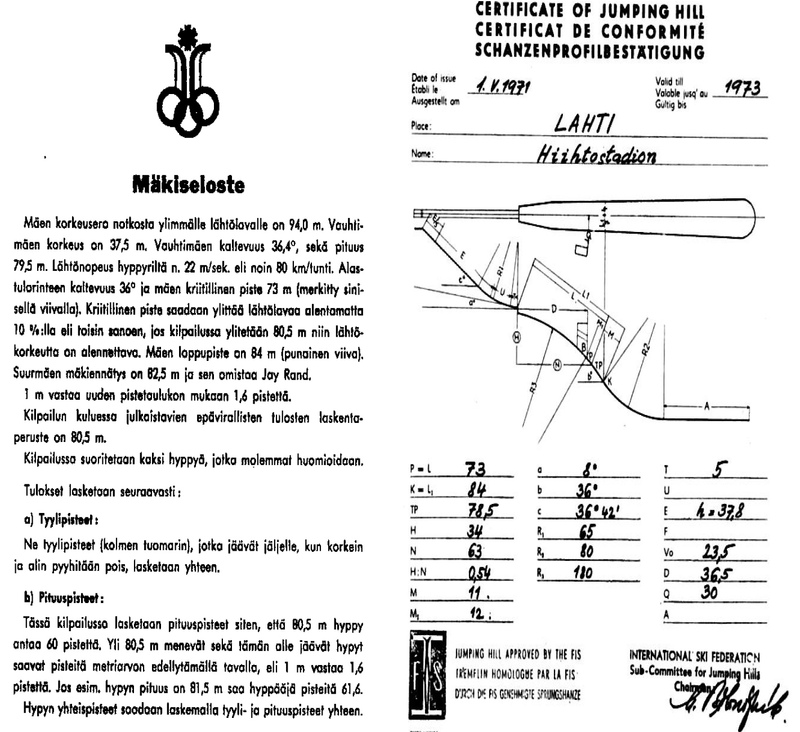 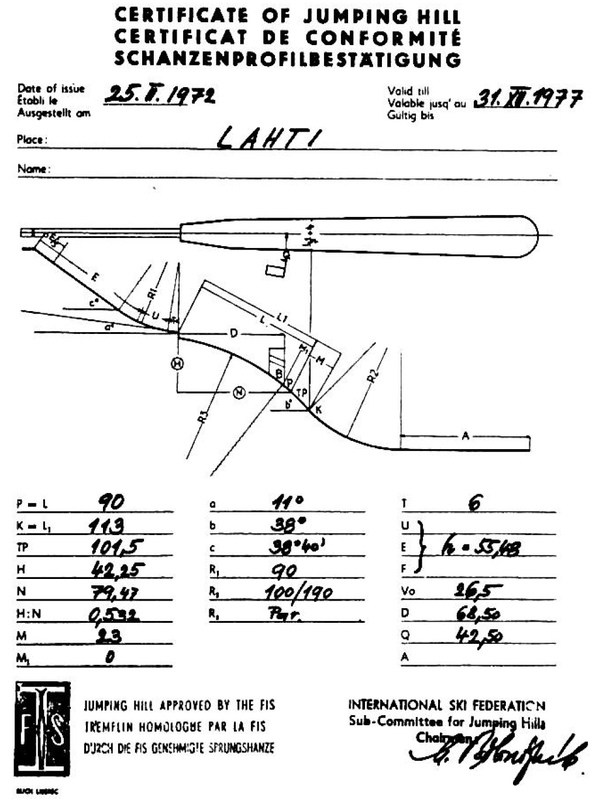 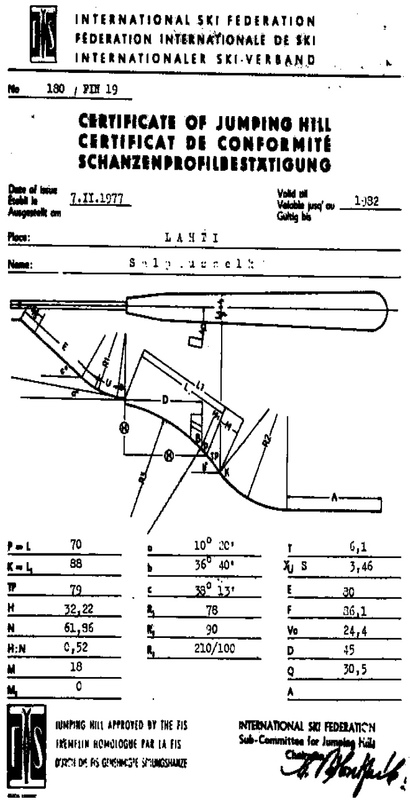 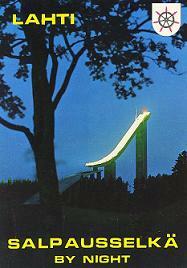 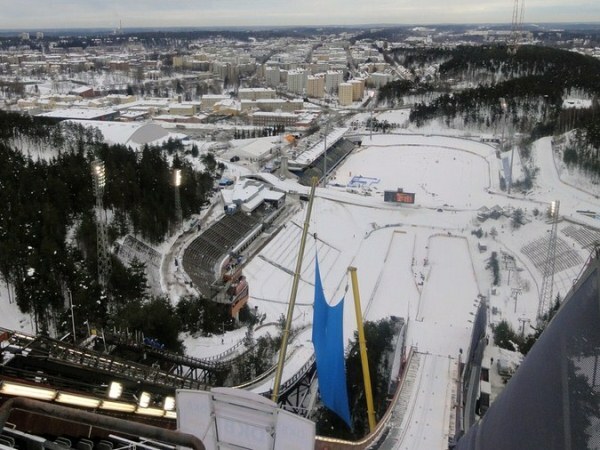 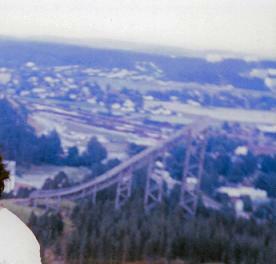 With the introduction of Ski Jumping World Cup in 1979/80 Lahti has been part of the annual circus of world’s best jumpers from the beginning. 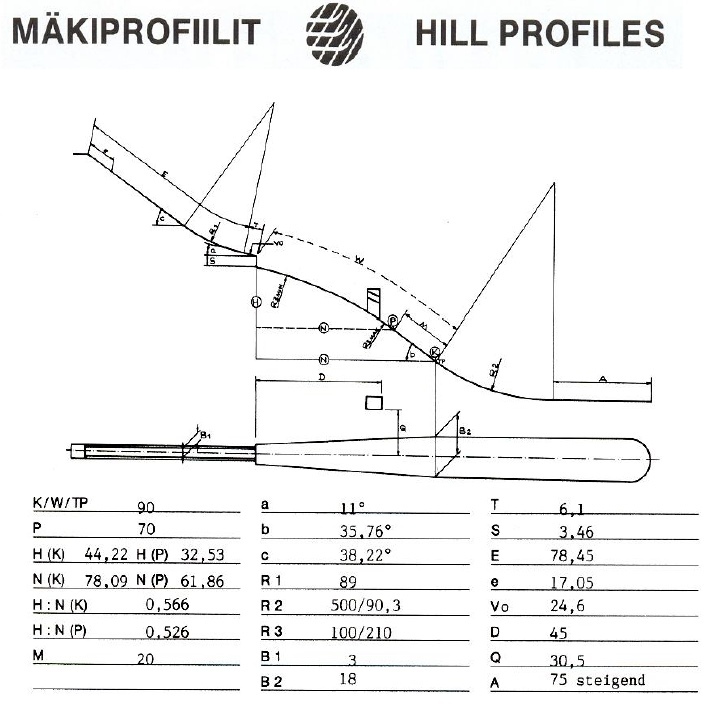 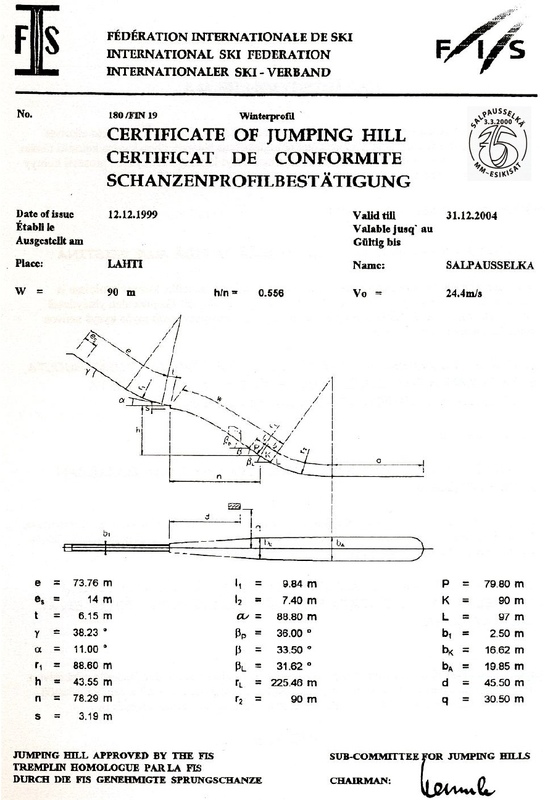 For the World Championships 1989 on the Salpausselkä hill K114 and K90 had been modernized. 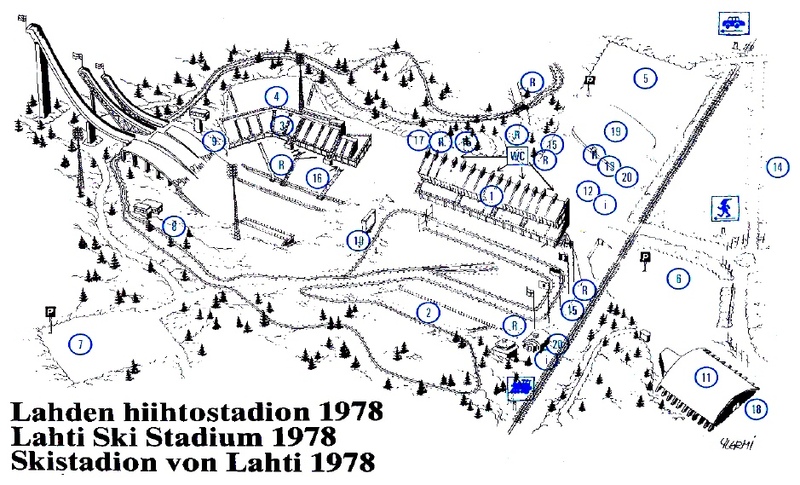 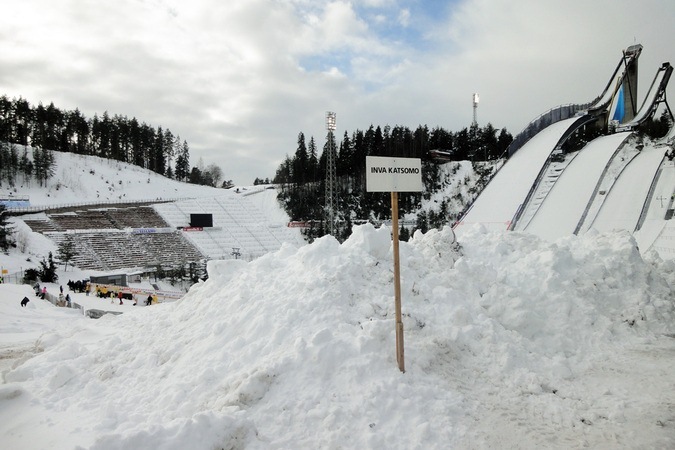 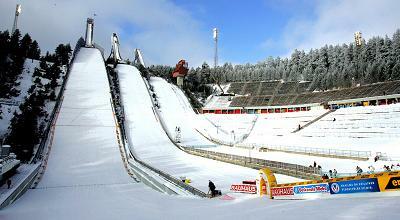 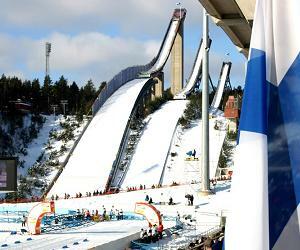 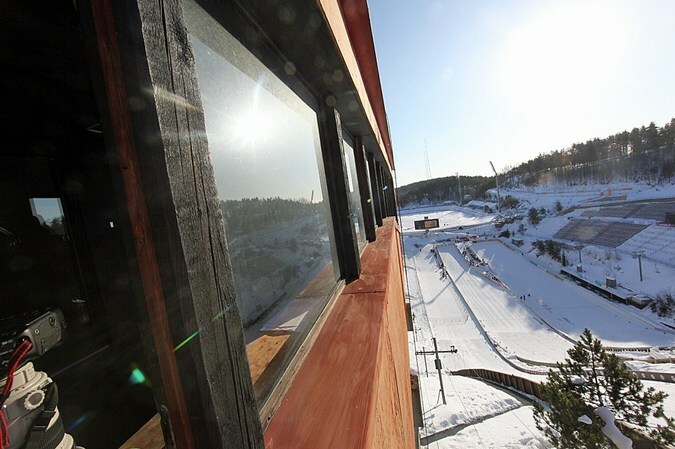 In ten days 450,000 spectators came to Lahti ski stadium. 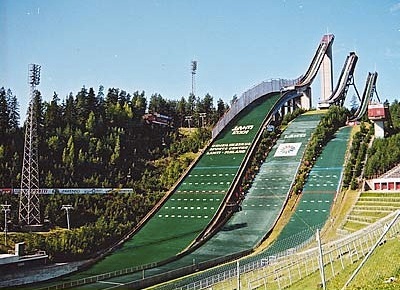 In 1997 the large hill was slightly modified into today's shape as a plastic covered K116. 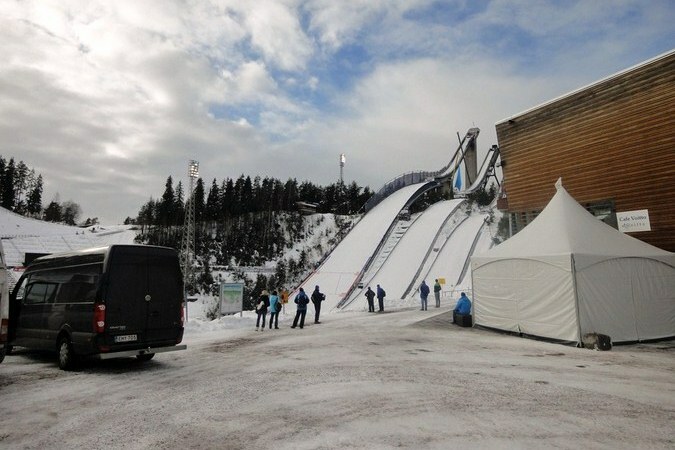 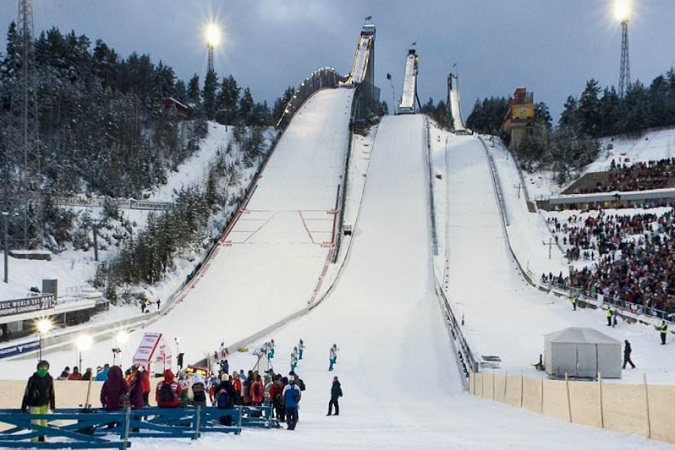 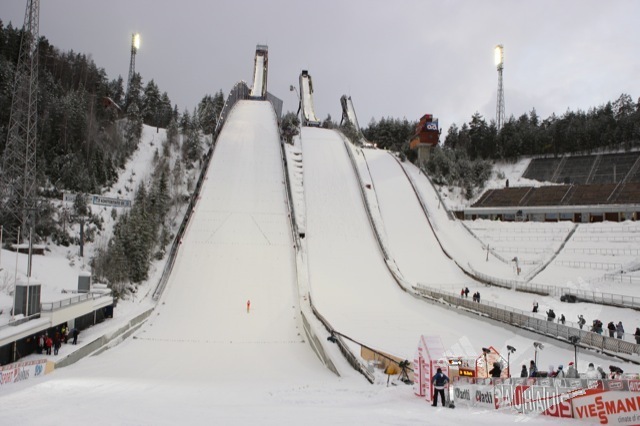 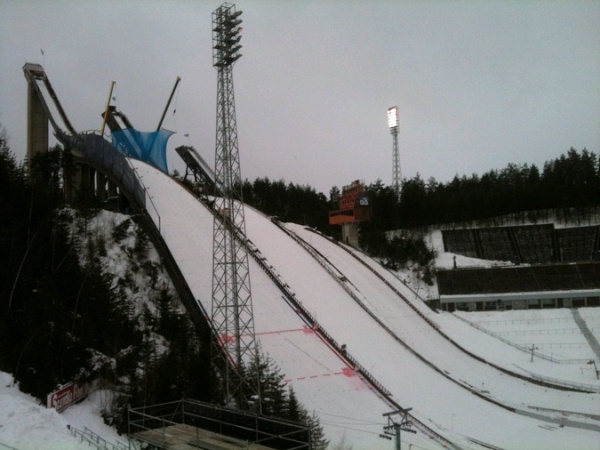 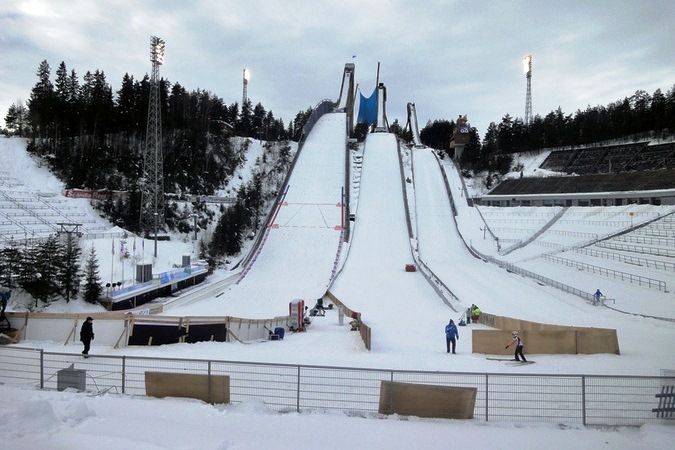 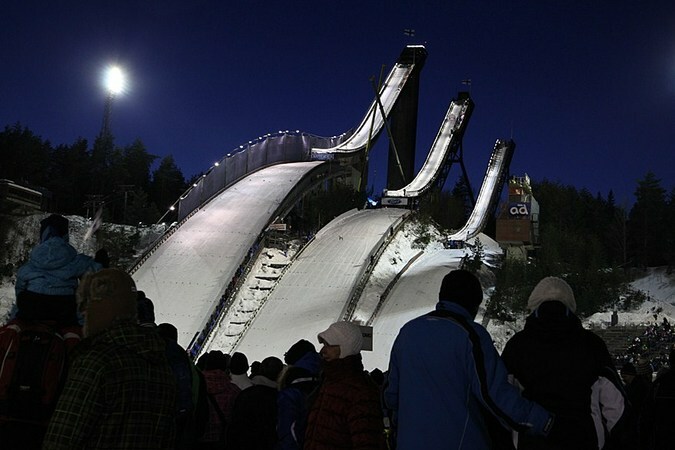 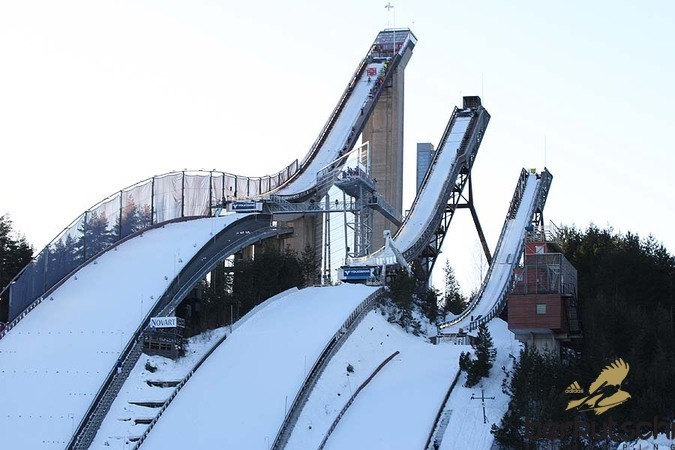 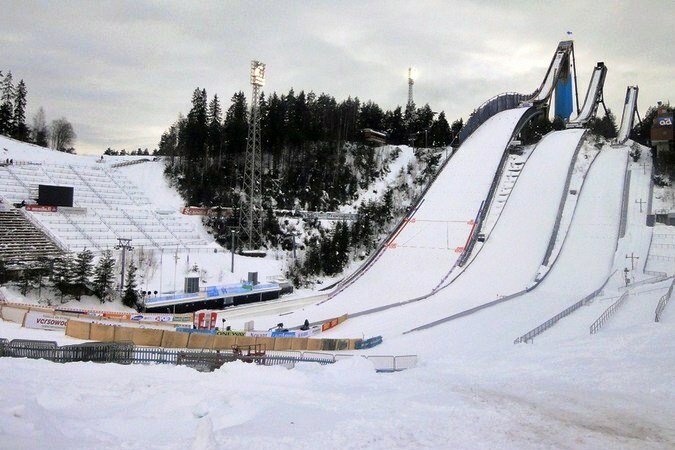 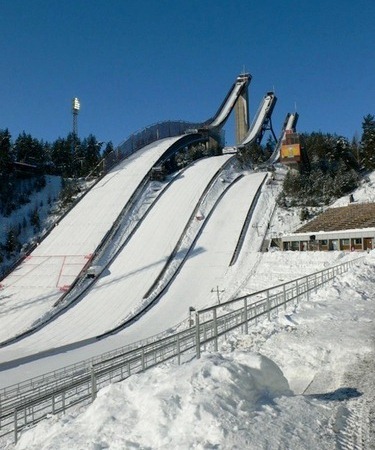 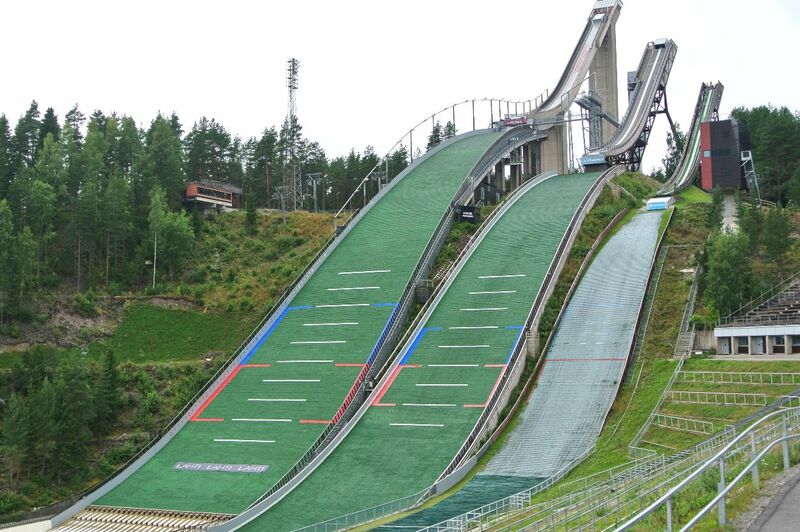 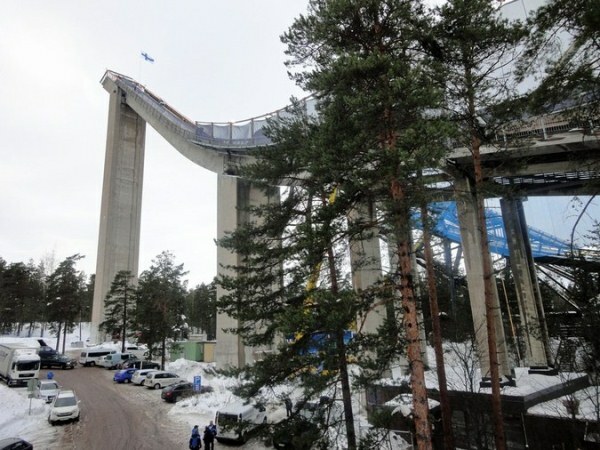 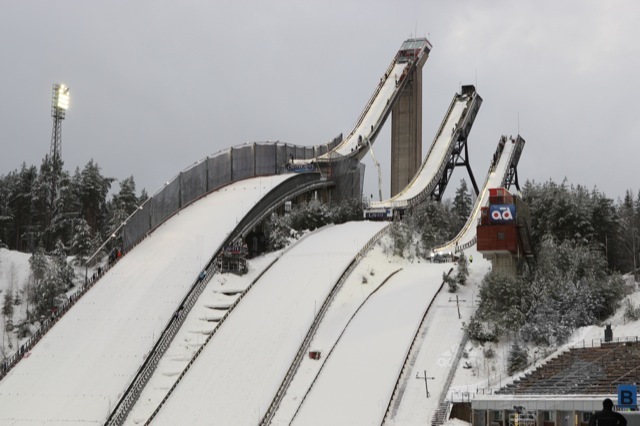 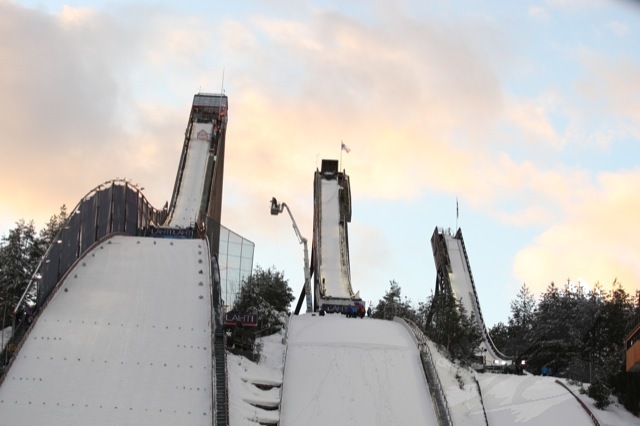 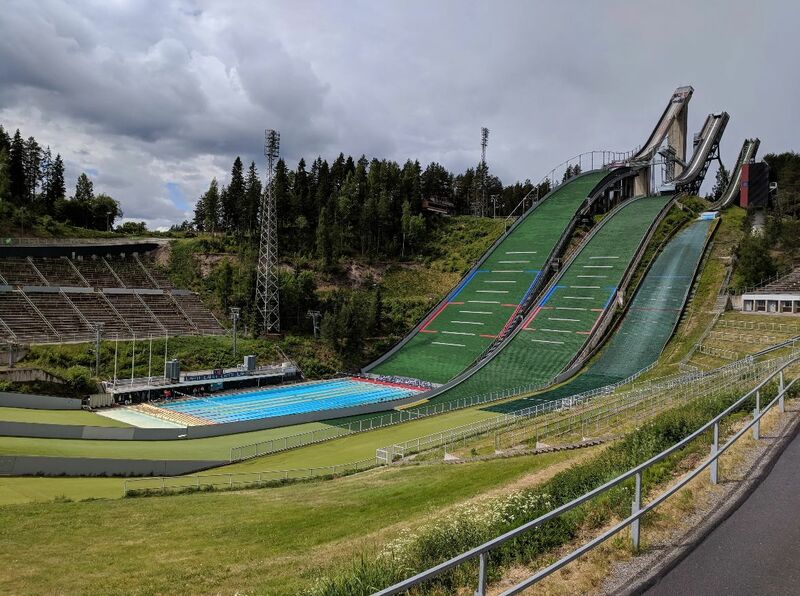 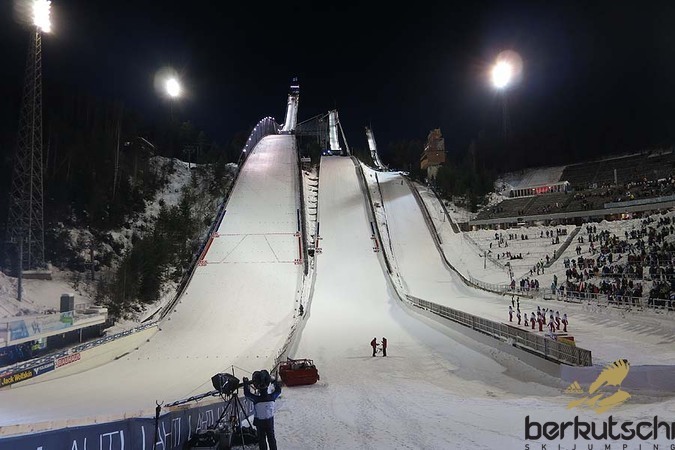 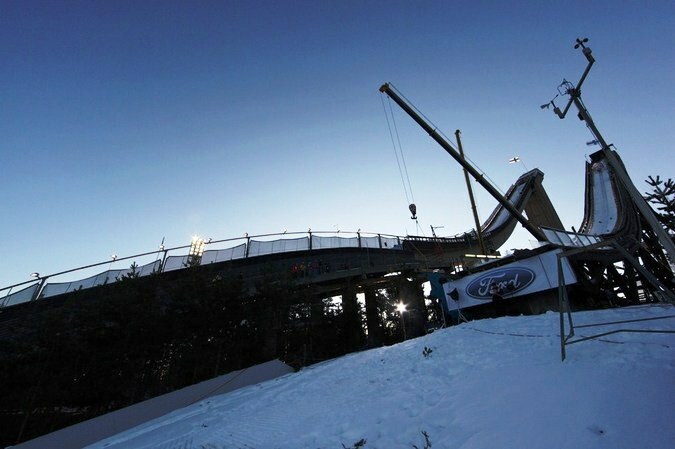 Two years later also the K90 was once again modernized and in 2001 the Nordic Ski WSC took place for the sixth time in Lahti on Salpausselkä ski jumps. 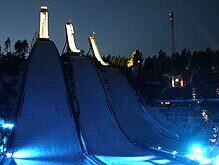 In 2005 the 80th Lahti Ski Games were celebrated. 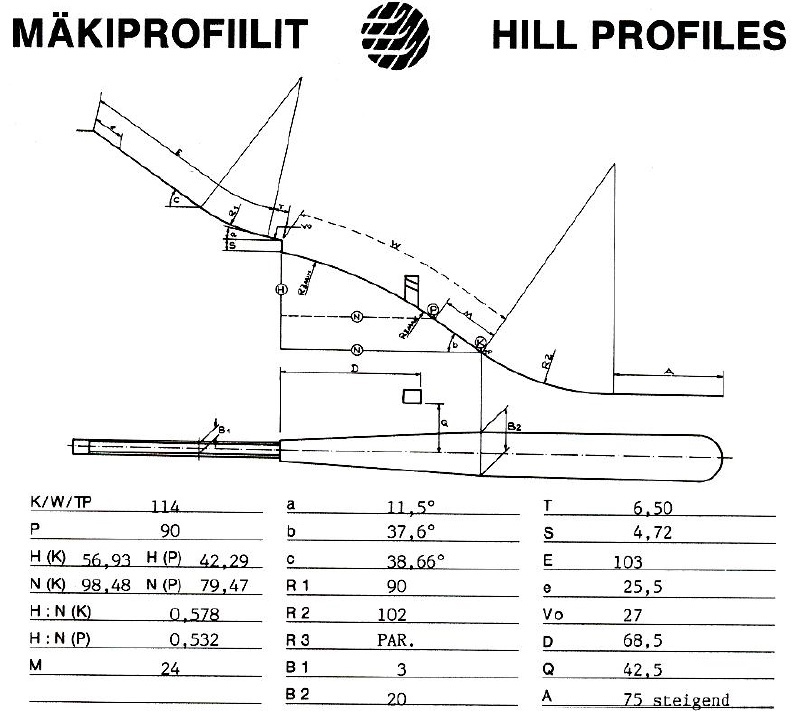 Prior to the 2017 Nordic World Ski Championships all three "Salpausselän hyppyrimäet" were modernized in 2015-2016. 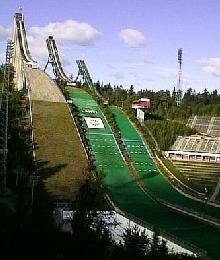 The hill size of the normal hill was increased from 97 to 100 meters. 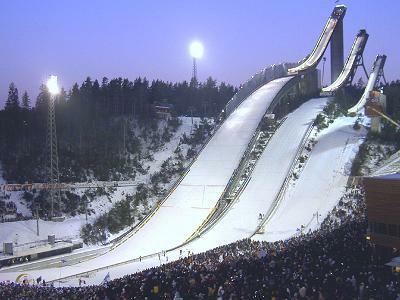 Situated at the southern border of the Finnish lakes area, Lahti is just 100 km north-eastern of Helsinki, the capitol of Finland. 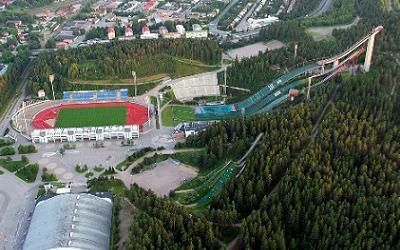 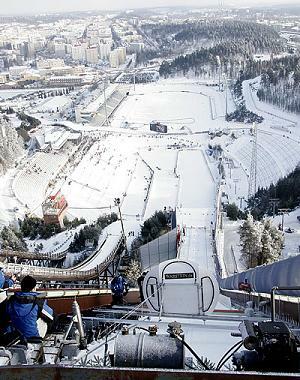 The city is a winter sports-centre that hosts the Finnish ski championships every year. 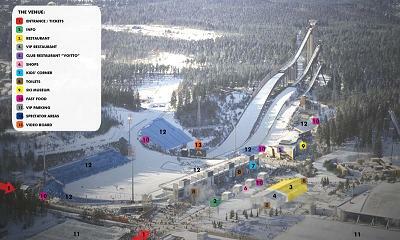 There are a ski-arena, a great indoor sports centre and a speed-skating track in the city. 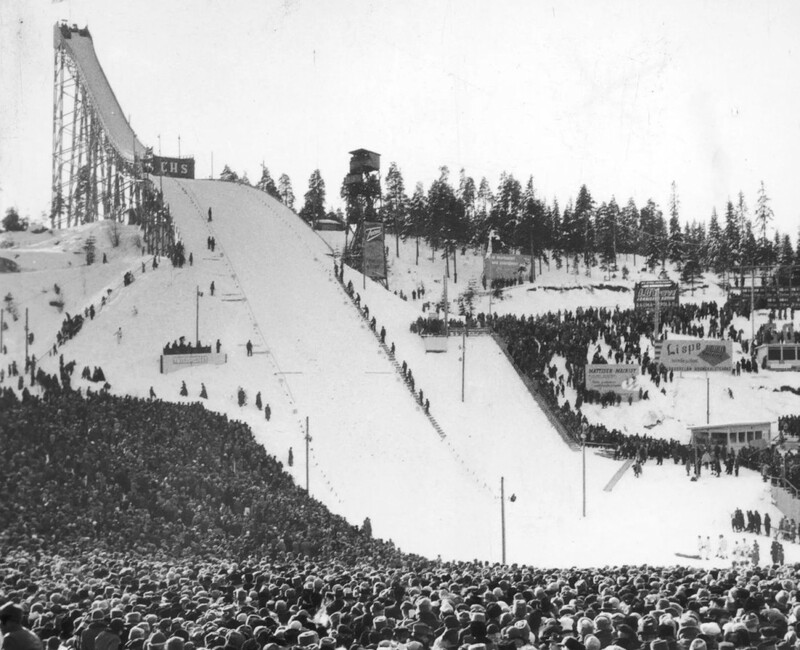 In 1926, 1938, 1958, 1978, 1989, 2001 and 2017 Lahti hosted the Nordic WSC.